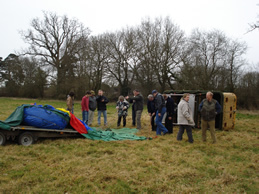 Last weekend, on Saturday the 7th of March, Aerosaurus Balloons in partnership with the WRBBAC held a Crew Training Day and Refresher Course. The day long course was for both pilots, crew and new trainees and covered everything you needed to know to be an advanced member of the crew. The day was split up into sections, going through the method of a real life flight. We started off by going through the preparation pre-flight, then proceeded to the rigging of a balloon (on the launch field) and then finished of with a lesson on propane and refueling. We also covered throughout the day: map reading, disaster management and land owner relations. The day was a great success and Aerosaurus Balloons would like to thank the guest speakers, whom came down from Bristol, Rick Hatton and Paul Spellward. If you’d be interested in working for Aerosaurus Balloons, check our vacancies page.